I wasn't a particularly good student when I was a kid. In grade school, I had a lot of problems with math, and to a lesser extent reading and writing. It didn't matter how much I tried, I just couldn't get it. I couldn't seem to grasp concepts that most of my friends seemed to understand easily. I didn't learn the same way they did -- I was an unconventional learner -- but I covered it up by being the funny kid in school. This happens more than you might think -- usually there are two outcomes: funny kid or tough kid. Luckily I was too skinny to be a bully. Back then my report cards said I "fool around lot in class" or "Robbie doesn't pay attention" or "he has ants in his pants." Differentiated learning back then meant a detention, extra homework or a call to the parents. "Students who perform below their intellectual capabilities may be considered underachievers, lazy, and/or just not very smart. These students may have difficulty processing information delivered by the conventional means and manner typical of traditional schools. This does not mean, however, that they are not capable of processing this information. What it does mean is that their brains process, store, and retrieve information in an unconventional manner. Unconventional learners are hidden within an educational system that is calibrated to deal with large numbers of conventional or, alternatively, clearly exceptional learners. Therefore, few diagnostic methodologies or support mechanisms exist for unconventional learners who function below their intellectual capabilities and have significant, but unrecognized, barriers to learning." Psychological assessments are available to help determine a child's unique learning abilities, but they often take a long time to schedule, can be expensive, and tend to label children in a school system full of labels that parents and students don't want. There aren't more kids today with ADHD than there were 25 years ago; it's just that 25 years ago the Psychiatric community didn't call it that. In fact, ADHD and ADD were added to the Diagnostic and Statistical Manual Version III in 1987, which explains my son's odyssey starting in kindergarten in 1998. He really wasn't any different in school than I was, it's just now they had a label for it that was better than "AITP" (ants in the pants). Or was it? Any parent with a child struggling in school knows exactly what I'm talking about. You dread that first meeting at the school to discuss your kid's poor grades. For most parents, this happens around grade 3 or grade 4. This is when our children go from learning about things to learning what those things mean (learning numbers is fine but learning how to add numbers together is a whole new ballgame). And that's where the difficulties typically begin. Cognition is defined as the scientific term for mental processes -- that is, how we learn. Since we all learn differently, it only makes sense that we all have different learning profiles. The problem is, how can we determine that learning profile in a way that is unobtrusive and accurate? In their paper "The Cognitive Neuroscience of Video Games" published in December 2004, Dr's Green and Bavelier concluded that "video games provide a medium that facilitates learning, and thus promotes changes in performance and brain organization, has led some to propose that video games are the teaching tool of choice of the 21st century." Not only can video games determine cognitive strengths and weaknesses, but, as Green and Bavelier state, "video game play has been shown to enhance numerous aspects of visual attention including the ability to divide and switch attention, the temporal and spatial resolution of visual attention, and the number of objects that can be attended." 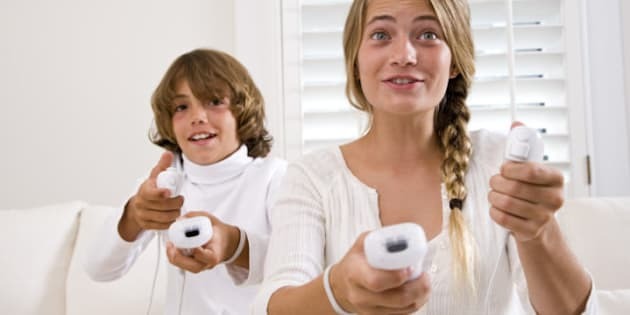 So not only can video game play determine a child's cognitive strengths and weakness, but if played properly, they can also be used to strengthen those weaknesses, thus improving cognition over time!